We have heard of this word "Immortality" and even have seen such creatures in hollywood films where an extraterrestrial creature is shown as immortal. i.e) It doesn't have death. But do you know...?? There's really an organism which is immortal in this blue planet. 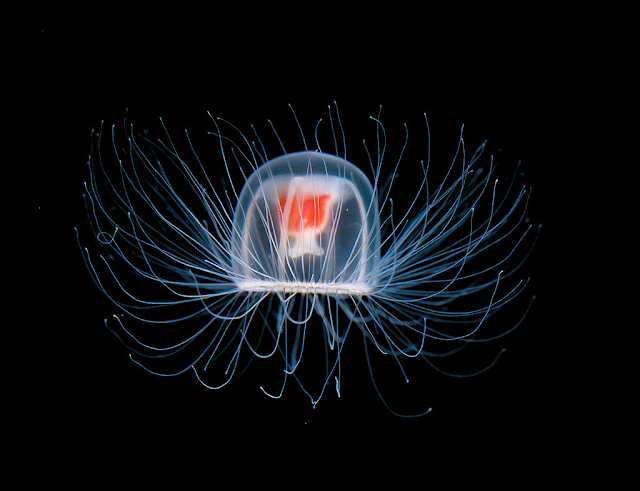 Turritopsis Nutricula a type of Jelly Fish also known as "The Immortal Jelly Fish" is a hydrozoan. As Like all other hydrozoans this jelly fish has two forms. Having a look at the Life Cycle of other Jellies and comparing may help you understand better. Turritopsis nutricula is the only known organism to completely go back to it's poly stage after being sexually mature in medusa form. After that it may again grow into a medusa become sexually mature again go back to polyp stage and so on. Then the polyp may give rise to other polyps through asexual reproduction predominantly through budding. This jellyfish goes back to polyp stage through a process called "transdifferentiation". Thus the jelly fish is biologically immortal. Unlike other jelly fishes... Turritopsis wont produce planula larvae instead of that they undergo regression and go back to polyp stage. But other jellies produce numerous planula larvae and then it will die after aging. The Planula Larva will grow into new polyps. Thus in a practical sense "Turritopsis nutricula" has no death and is immortal. And it is the "One and Only" multicellular animal to posses this interesting property of biological immortality.